Tiger Bill Reviews John Blackwell Hudson Music Master Series DVD. 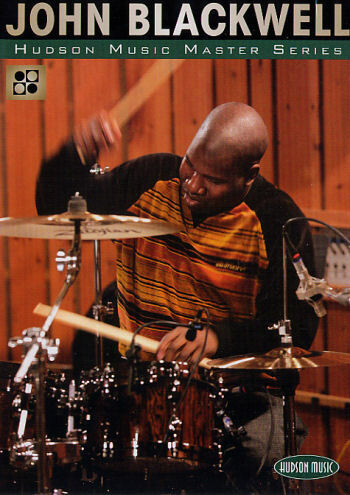 John Blackwell, drummer for artists such as Prince, Pattil LaBelle, and Justin Timberlake first came to my attention at a Modern Drummer Festival. His performance showed that he not only had groove but could more than hold his own when it came to drum soloing and showmanship too. Let's check out his DVD on the Hudson Music Master Series. This DVD contains nearly three hours of footage consisting of John interspersing teaching and playing with his band live in front of an intimate audience of drummers. John Introduces his band Gary Grainger on bass, Mike Scott on guitar, and Corey Bernhard on keyboards. Original composition by Blackwell written and named for his son. A light funky tune. John explains his approach to grooving while reinforcing other members of the band and his experiences playing with Prince and other artists, and he offers 3 tips that are essential for drummers who want to get and keep a gig! John answers questions about how he gets his high profile gigs and offers his advice on how others can do the same. He also demonstrates the groove from 7-7-7-93-11, which Prince originally recorded using a drum machine. Demonstrations of how to play in the pocket. John again uses his live band to demonstrate how to play along with pre-recorded tracks. John explains how he practiced at an early age to begin to develop his own sound and demonstrates using the grooves to some of his favorite songs that he played to as a kid, including "Flirt" by Cameo and "Do That Stuff" by Parliament Funkedelic. John fields a question from the audience asking how one goes about learning to copy drum parts on a drumset that were originally played using drum machines. John includes a groove he played with Justin Timberlake. Applications of old-school stick-on-stick techniques to modern musical styles. One of John's early, and favorite, drum instructors teaches a master class on the foot technique and soloing concepts that he taught John. John and Marcus play this funk-filled tune (named after John's son) together with the band. John's approach to open-handed playing. How and why John learned to play with his entire body. Marcus Williams answers an audience question about one-handed rolls with a demonstration and John plays his variations of the one handed roll. John plays an example of a groove played behind-the-beat with bassist Gary Grainger. John demonstrates the playing style and techniques of one of his all time favorite drummers - Billy Cobham. The composition John wrote for his daughter, Jada. The approach John uses to develop the ability to play at various tempos. The bass player fields questions from the audience concerning the approach to keeping time with the drummer and the rest of the band. John explains how he developed his ability to play a string of continuous sixteenth-notes imitating double pedal chops with a single pedal. John demonstrates double pedal techniques using a single pedal. Demonstration of what John plays on the drumset in his regular practice routine. John's response to an audience question asking what he uses the China cymbal set up behind his drumset for after which he demonstrates a drum solo incorporating showmanship including his special brand of stick twirling. John takes it home with this final tune. Include John playing drum solos at Berklee College of Music in 1994, 2003, and 2004 plus an eBook that contains written examples of many of the grooves and solos throughout the DVD. You can access the PDF eBook on any computer and easily print down the examples to add to your own workouts. Ever since I first saw John perform at Modern Drummer Fest, I loved his style. He combines solid groove chops with solo and showmanship abilities. I like his creative approach to applying old-school techniques to today's music and his total overall approach to drumming, which is highly creative. I highly recommend this DVD to drummers of all experience levels and all styles. It is entertaining, educational, and will help just about anyone expand their creativity. And, to me, creativity is what separates the truly great drummer from the average drummers.